Tracey-[sic],-Minn., engine of the South Dakota division, Detroit-Publishing Co., Published between-1880 and 1930. In 1853 when Carnegie joined the Pennsylvania Railroad, trains carried a sense of wonder. At six cents a mile, a ride didn't come cheap, but it guaranteed a thrill. The locomotive hurtled down the rails at heart-pounding speeds approaching 30 miles per hour. The Pennsylvania was already one of the nation's largest railroads, boasting a single track between Pittsburgh and Philadelphia. To step aboard a train on the Pennsylvania meant stepping into the future. The railroad was a technological risk-taker, experimenting in 1858 with the unorthodox notion of using coal instead of wood for locomotive fuel. A year later, the Pennsylvania replaced the candles in its cars with gas lamps. The cars themselves weren't much to look at, though. Simple wooden benches were the rule, and ventilation was poor. Passengers could open windows, but only at the risk of inviting smoke and burning cinders into the car. What a difference a few years would make. In 1865, George Pullman would introduce his revolutionary Palace cars. Finally passengers, for an extra two dollars, could ride in style, comforted by elegant window curtains, beautiful chandeliers, carpeted floors and elaborately painted ceilings. But in the 1850s, safety was a more basic concern. Locomotives were safe enough if the boiler steam remained at moderate levels, but if stoked too high, the consequences were explosive. The tracks themselves were not much safer. The iron rails tended to give out within 10 years, and derailments were uncomfortably common. Wooden railroad trestles were frequently destroyed by fire or flood. Despite the obstacles, the railroads expanded quickly. In 1835 there were only 1,000 miles of track in the United States. By 1865 there would be some 35,000 miles; in 1880, 93,000 miles. For now, in the 1850s, the railroads connected only a handful of major cities, and most lines did not connect to others. But there were big plans afoot, with talk of connecting the coasts by rail. As the railroads expanded, they struggled with "local mean time." In every town the church bell rang noon when the sun looked to be most directly overhead. It was never the same time at any two stations on the line. Boston, for example, is always 12 minutes ahead of New York. For railroads trying to keep a schedule, these local times meant headaches. 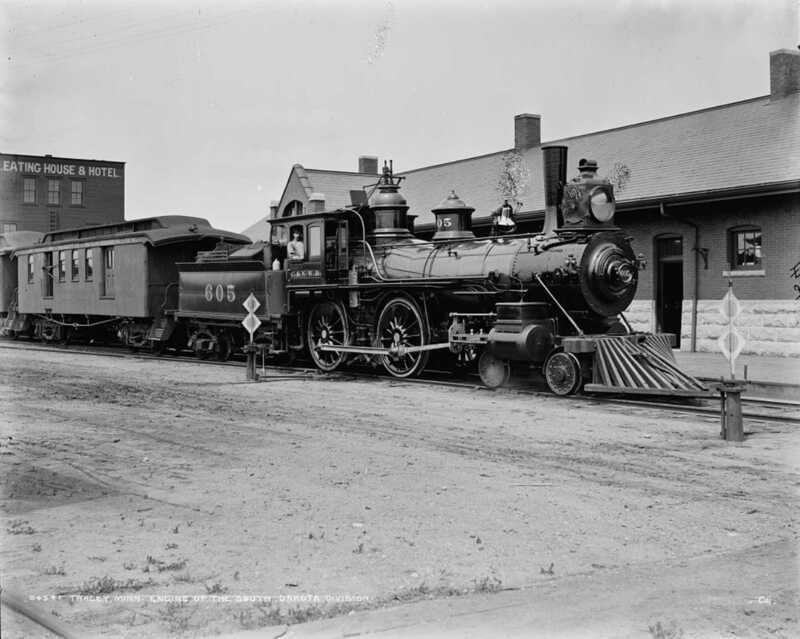 In 1883, the railroads forced a change. 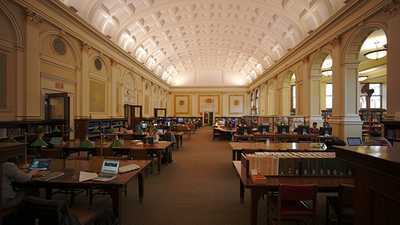 Without any act of Congress or the president, they instituted the four standard time zones, and most communities adjusted their clocks accordingly. In the 1850s, though, the full scope of the railroads' impact remained unimagined. For now, passengers were content to rattle slowly from Philadelphia to Pittsburgh -- sitting uncomfortably on their wooden benches. 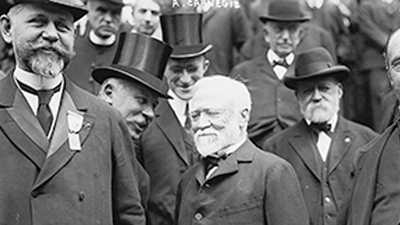 Andrew Carnegie made his fortune and then, unlike any industrialist of his time, began systematically to give it away. 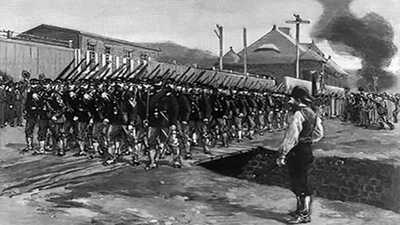 The bitter conflict in 1892 at his steel plant in Homestead, Pennsylvania revealed Andrew Carnegie's conflicting beliefs regarding the rights of labor. During the "Gilded Age," every man was a potential Andrew Carnegie, and Americans who achieved wealth celebrated it as never before.